Pretty soon, those red-and-green confections will disappear from retailers' shelves, but where do they go? There’s that day in January when you go to the store and see no more festive candy canes, holiday-themed Hershey's Kisses or red-and-green colored M&Ms; the holiday-themed Whitman's Samplers, the chocolate Santas bundled in colorful foil wrappers, those chocolate "oranges" — all gone without a trace. 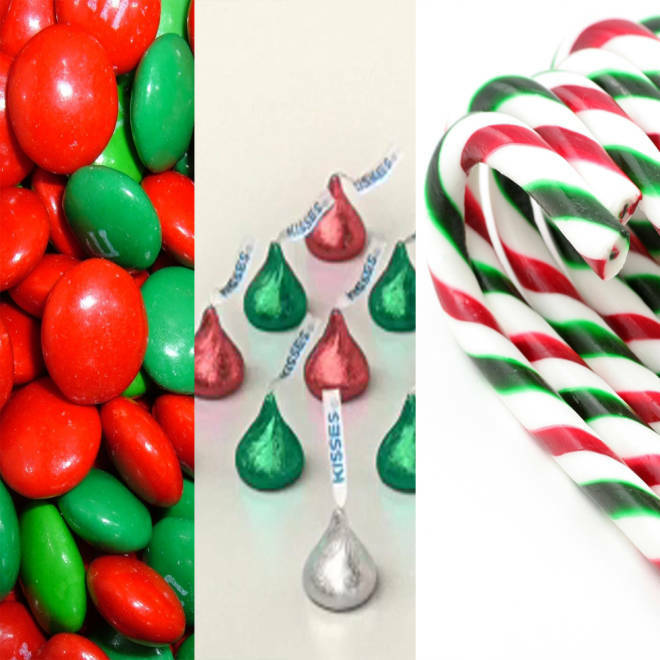 They may be overflowing into the aisles of your local big box retailer or drugstore right now, but after the holidays are officially over, where do all of these Christmas-specific sweets end up? Are they destroyed? Given to charity? Sent to the North Pole? If, like I did, you always thought that, come January 1, they went into hibernation in the closets of every grandmother in America — tucked in with the leftover wrapping paper and recycled gift boxes before being pulled out and dumped right back into the Christmas candy dish the next year — you may be partially right. "Generally, stores really do sell through most of their inventory by lowering prices," said Michael Allured, publisher of candy trade magazine The Manufacturing Confectioner. "All but a very small portion is sold, the rest may go to a food pantry like Second Harvest. But every retailer has to deal with their own leftover inventory on their own." He also has observed that manufacturers are now starting to make seasonal candies with more general motifs so that they have a longer shelf life. "For Halloween, for example, they'll have more of a fall motif than a specific Halloween motif,” he said. “It gives the candy more staying power and keeps waste down." Anna Lingeris, global brand manager for The Hershey Company, which makes a broad assortment of Christmas confections, from Jolly Rancher candy canes to Reese's peanut butter holiday trees (the best-sellers are still those classic Hershey’s Kisses dressed up in festive holiday hues), told TODAY.com that, "We only make as much as we already have orders for. Generally, product leftover from the holiday season is discounted per the retailer; however, The Hershey Company does donate a portion of unsold candy to various organizations including Feeding America, Operation Blessing and others." "When it comes to seasonal products, we don't even make any Christmas-specific products unless we already have an order for it," explained Tom Ward, president of Russell Stover, which also produces Whitman's. Ward says if the company does end up with extra inventory, due to a retail customer purchasing a smaller quantity than originally promised, they’ll send the excess to their own Russell Stover retail stores, mark it down and eventually it may end up at a food pantry or the Salvation Army. But once the retailer purchases the candies, that retailer is responsible for moving the product. Of course, once December 25 has passed — and often before — the price-slashing begins as stores pull out the big discounts in order to move inventory. And, interestingly, all of the retailers we contacted said the pre-and-post-Christmas sale prices, along with careful buying practices, were enough to make the candy disappear. A spokesperson for Walmart stores said that they typically sell out of all of their holiday candy, discounting it after Christmas and allowing stores to keep it on sale at their discretion. Target had an almost identical response. At Walgreens, the candy also magically disappears thanks to sale pricing. And at Family Dollar stores, roughly 75 percent of the holiday candy stock is sold before Christmas and the rest sold after. So what about folks who are buying those candies after Christmas and archiving them, along with discounted wrapping paper, for the next year? Do they really last and, more importantly, will they still taste good? When it comes to items like Hershey's Kisses, the candy buy-and-hoard contingent is in luck. "They generally have a shelf life of up to 11 months,” Lingeris said. “Chocolate products will maintain their quality if stored in a cool, dry place (55-60 degrees F)." As for the swankier gift boxes? Not so much. "The Russell Stover and Whitman's boxes all have a customer-facing 'best by' code," said Ward. "They're different depending on the item, but the seasonal samplers, for example, are generally good for two months after the holiday season. After this date, we request that the retailer no longer sell the product." Allured agrees you won't want to keep them, or any other higher-end box chocolates for very long, as the quality deteriorates quickly. "The center fillings will lose their flavor and with more expensive chocolates that use heavy cream, they can eventually spoil." Your best bet for long-term candy storage? Hard candy. When the apocalypse comes, it sounds like it's going to just be the cockroaches and… candy canes. "Things like candy canes or ribbon candy are good for well over a year, up to five years possibly. The sugar creates a matrix that holds it all together," said Allured. This is as long as you store it in a cool, dry place: "Humidity is the enemy." Ward also answered a pressing question we've always wanted to know the answer to: which side of the dividing line does he fall on when it comes to taking a nibble out of a chocolate and then putting it back if you don't like the filling? "I think it's really rude!" he said. So there you have it, straight from the president of the company. Kirsten Henri loves any kind of chocolate with a coconut center, but thinks the ones filled with fruit should be considered punishment, not dessert.